T. Flavius Domitianus was the younger son of Vespasian and was born at Rome A.D. 51. When Vespasian was proclaimed Emperor by the legions in the East (69), Domitian escaped being murdered by Vitellius. After the fall of Vitellius, Domitian was proclaimed Caesar. Obverse: IMP CAES DIVI VESP F DOMITIAN AVG P M, Head, laureate, right. Reverse: TR P COS VIII DES VIIII P P S C, Minerva standing right, raising javelin and holding shield. Reverse: TR P COS VIII DES VIIII P P S C, Minerva standing left, holding thunderbolt and spear; shield resting on ground behind. Obverse: IMP CAES DOMITIAN AVG GERM COS X, Bust, laureate, right, with aegis. Reverse: SALVTI AVGVSTI S C, Altar. Obverse: IMP CAES DOMITIAN AVG GERM COS XI, Laureate bust right, wearing aegis. Reverse: IOVI CONSERVAT S C, Jupiter standing left, holding thunderbolt and scepter. Reverse: MONETA AVGVST S C, Moneta standing left, holding scales and cornucopia. Reverse: SALVTI AVGVST S C, Altar. Obverse: IMP CAES DOMIT AVG GERM COS XI CENS PER P P, Bust laureate right, with aegis. Reverse: IOVI CONSERVAT S C, Jupiter standing left, holding thunderbolt and sceptre. Obverse: IMP CAES DOMIT AVG GERM COS XI CENS POT P P, Bust laureate right, with aegis. Reverse: S C, Mars hastening left, holding Victory and trophy. Reverse: S C, Victory advancing left, holding round shield inscribed S P Q R.
Reverse: SALVTI AVGVSTI, S C across field, large altar. Reverse: VIRTVTI AVGVSTI, S C across field, Virtus standing right, holding spear and parazonium, foot on globe. Obverse: IMP CAES DOMIT AVG GERM COS XII CENS PER P P, Bust laureate right, wearing aegis. Reverse: FIDES PVBLICAE S C, Fides standing right, holding basket of fruits and corn-ears. Reverse: FORTVNAE AVGVSTI S C, Fortuna standing left, holding rudder and cornucopia. Reverse: MONETA AVGVSTI S C, Moneta standing left, holding scales and cornucopia. Obverse: IMP CAES DOMIT AVG GEM COS XII CENS PER P P, Bust laureate right, wearing aegis. Reverse: S C, Mars hurrying left, holding Victory and trophy. Obverse: IMP CAES DOMIT AVG GERM COS XIII CENS PER P P, Bust laureate right, wearing aegis. Reverse: FORTVNAE AVGVSTI S C, Fortune standing left, holding rudder and cornucopiae. Obverse: IMP CAES DOMIT AVG GERM COS XIII CENS PER P P, Bust laureate right. Obverse: IMP CAES DOMIT AVG GERM COS XIIII CENS PER P P, laureate head right. Reverse: FIDEI PVBLICAE S C, Fides standing right, holding basket of fruits and corn-ears. Obverse: IMP CAES DOMIT AVG GERM P M TR P VIII CENS PER P P, laureate head right. 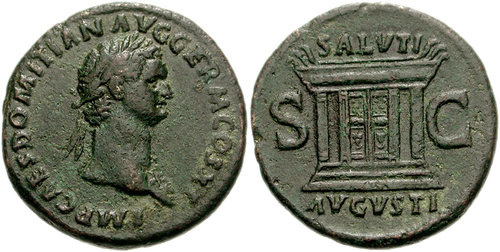 Reverse: COS XIIII LVD SAEC FEC S C, Domitian standing left, sacrificing over altar; to left, lyre and flute players standing right; hexastyle temple in background. Obverse: IMP CAES DOMIT AVG GERM COS XV CENS PER P P, laureate head right. Obverse: IMP CAES DOMIT AVG GERM COS XVI CENS PER P P, laureate head right. Reverse: MONETA AVGVSTI S C, Moneta standing left, holding scales and cornucopiae. Obverse: IMP D CAES DIVI VESP F AVG P M TR P P P COS VII, Head, laureate, right. Reverse: CERES AVGVST S C, Ceres standing left, holding corn-ears and torch.